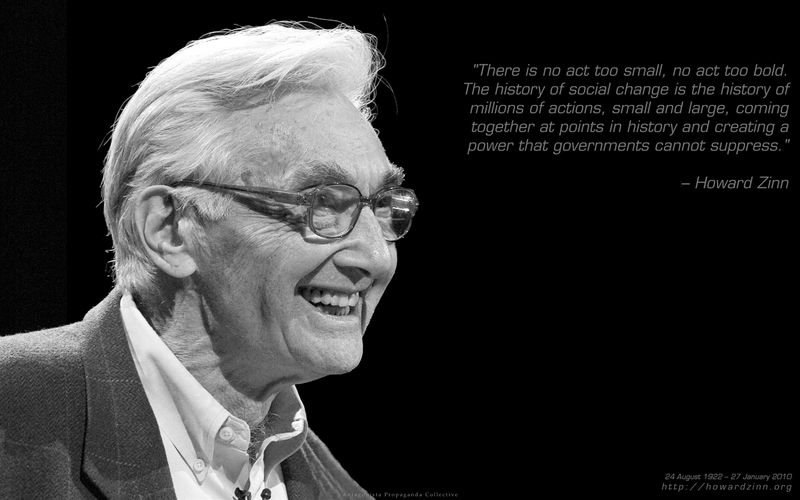 Howard Zinn would have turned 90 a couple of days ago [24 August 2012]. I have to imagine after reading and re-reading most of Zinn’s works that if Zinn were alive today, he would remain baffled at how America is a country antagonistic to unions and tenure, especially teachers unions and tenure. Zinn was a radical historian, activist, and in my opinion, most of all a teacher. And it is at the overlap of Zinn as historian/activist/teacher I find his People’s History of the United States an invaluable place to ask, Why tenure and unions? On Democracy and Equity in the U.S. The unique and powerful quality Zinn brought to history is that his volume is a people’s history. Zinn confronts directly that the truth embedded in any history is shaped by perspective. Traditionally, the so-called objective history students have been and are fed in formal schooling is from the point of view of the winners, but Zinn chose to examine the rise and growth of the U.S. from the point of view of the common person—what I will characterize as primarily the viewpoint of the worker. I am most concerned about the contrast between the political and public message that the U.S. has somehow left behind the oppressive corporate world of the robber barons (see Zinn’s Chapter 11) and have left behind the horrors fictionalized in Upton Sinclair’s The Jungle. These idealistic beliefs are similar to Americans claiming we have achieved a meritocracy instead of the fact that Americans should still be working toward a meritocracy. Still in 2014, Americans appear to be anti-union and anti-tenure, again notably in terms of how that impacts teachers. This sentiment is disturbing to me as it signals an anti-worker sentiment in the U.S.—a country that claims to embrace ideals such as equity, democracy, and hard work. This contradiction is connected, I believe, to the exact problem confronted by Zinn as a historian: Americans’ anti-worker sentiments (expressed in anti-union and anti-tenure discourse and policy) can be traced to who controls the public narrative—the CEO elite. If the American public considers for a moment why unions and tenure exist (as well as what tenure means), most Americans would reject the CEO-skewed messages about both. The American worker (unlike many workers in other comparable countries throughout the world) remains shackled to working in ways that dictate any worker’s essential humanity; work in the U.S. is not a matter of just pay, but of health insurance and retirement—essential for basic human dignity. The dramatic abuses of the meat packing industry in The Jungle may appear more extreme than working conditions in 2014, but bosses and management hold a powerful upper-hand over the American worker still. Unionization as a concept, then, came out of and remains an act against the inherent inequity and tyranny in the workplace when the powerful few control the working many. Unionization is an act of democracy, an act of equity. To reject unions is to reject democracy and equity. These foundational facts of why unions do not reject that specific union policies have failed. It is certainly legitimate to confront individual union policies and outcomes (I have and continue to do that myself), but this discussion is about the broad anti-union sentiment in the U.S. that reveals anti-worker sentiments. Tenure is more complicated, but certainly grows out of the same commitment to democracy and equity—especially for teachers. The tenure argument is often distorted because the term itself, “tenure,” is misrepresented as “a job for life” and rarely distinguished between tenure at the K-12 level and the college/university level. Tenure is an act of democracy and equity, as well, because it creates power for workers as a guarantee of due process and, for teachers, it secures a promise of academic freedom. Are there failures in how unions and tenure have been and are implemented in America today? Yes. Should those failures be addressed? Yes. But the broad anti-union and anti-tenure agenda being promoted by the CEO elite and embraced by the American public is a corrosive rejection of equity and democracy. When unions and tenure are not fulfilling their obligations to equity and democracy, they both must be confronted. But unions and tenure remain needed and even necessary mechanisms in America’s search for equity and democracy—both of which are being eroded by the American elite indebted to and dependent on the inequity that drives American capitalism. We are penned in by the arrogant idea that this country is the center of the universe, exceptionally virtuous, admirable, superior. If we don’t know history, then we are ready meat for carnivorous politicians and the intellectuals and journalists who supply the carving knives. I am not speaking of the history we learned in school, a history subservient to our political leaders, from the much-admired Founding Fathers to the Presidents of recent years. I mean a history which is honest about the past. If we don’t know that history, then any President can stand up to the battery of microphones, declare that we must go to war, and we will have no basis for challenging him. He will say that the nation is in danger, that democracy and liberty are at stake, and that we must therefore send ships and planes to destroy our new enemy, and we will have no reason to disbelieve him. As a life-long resident and worker in South Carolina, a right-to-work state, I want to clarify here that I am not now and have never been a member of a union, I never had my pay or any sort of public school tenure negotiated for me by a union, but I have been awarded tenure by my private university during my most recent decade-plus as a professor.